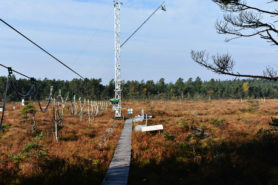 Main topic of my Phd is assessing CH4 emissions from Swedish wetlands. I’m doing my Phd at Lund University, Sweden. During my studies I have to visit two academic partners and one non-academic. My first visit was in Royal Holloway, University of London. I was there from 19th November to 30th November 2018. During this secondment I learned about stable carbon isotope from methane and how to measure it using mass spectrometer. Delta Ray analyzer from Thermo Fisher is measuring a stable carbon isotope of carbon dioxide. 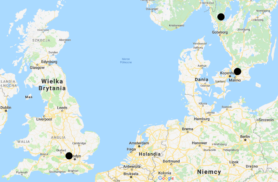 Mycklemossen is located in southwestern Sweden, 100 km north of Gothenburg, around 350 km from Lund and around 1100 km in straight line from Egham, where I had my secondment. On this wetland I took more than hundred air samples, from automatic chamber system, to bags. The system is built with six automatic chambers, pumps, logger and CRDS analyser. Every chamber is measured half hour during daytime between 7 am and 7 pm CET. 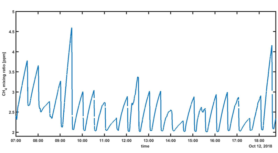 As for methane fluxes, no diurnal cycle is expected, nighttime is used for measuring ambient air. Five minutes from this half hour is for flushing the system. Flushing the system is necessary for isotope analysing, to be sure that the instrument measures air only from one chamber, and not a mixture from different chambers. Twenty-five minutes from this half hour is measured air from chamber. 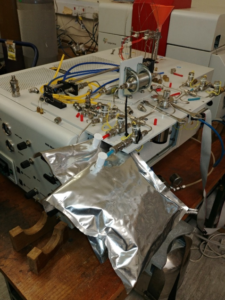 Based on the information from the CRDS analyser it is possible to calculate methane, carbon dioxide, water vapour luxes and stable carbon isotope composition for methane and carbon dioxide. 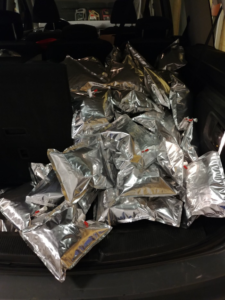 If you ever thought how 100 bags of sampled air would look like in a car I could show you. I send half of these samples to Egham, to measure it during my secondment and the other half to Utrecht. The Utrecht group also has a mass spectrometer, so after all I will be able to compare results from three instruments. I spent two weeks on secondment at Royal Holloway, University of London. Air from more than 50 bags was analysed using mass spectrometer. 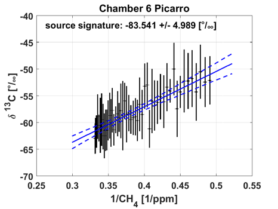 Based on the results from this instrument, stable carbon isotope signature of methane source was estimated. To calculate these values, I used keeling plots. In simple words I plotted inverse methane concentration on the x-axis and δ13C on y-axis and added linear fitting. This is a simple and common used method, assuming that if methane concentration increase to infinity, stable carbon isotope will be only from our source. But it is easier to use inverse of methane concentration, because interpolation to infinity is more complex than interpolation to zero. 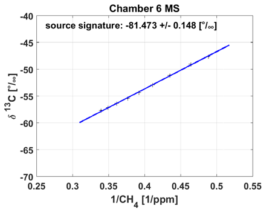 During this secondment I learned how to use mass spectrometer and how to calculate stable carbon isotope of methane. Moreover, it was time when I could cooperate with MEMO2’s students in a different country and specialists on their host university. Of course, a secondment isn’t focused only on science. It was time to sightsee local pubs, where I could drink beers or ciders, and ate fish and chips or other pub food. To summarize, it was a good time with friendly people in a nice place.